You may have heard about the impressive and flashy new moving skyscraper set to be erected in Dubai. 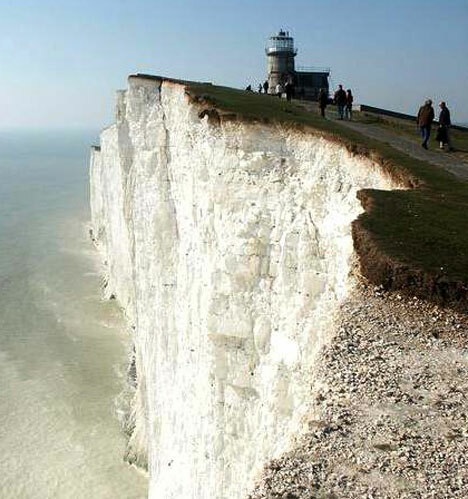 However, did you know that one man is single-handedly rebuilding his own stone henge (without modern machinery) or that entire Egyptian temples (originally carved out of mountainsides) have been relocated? 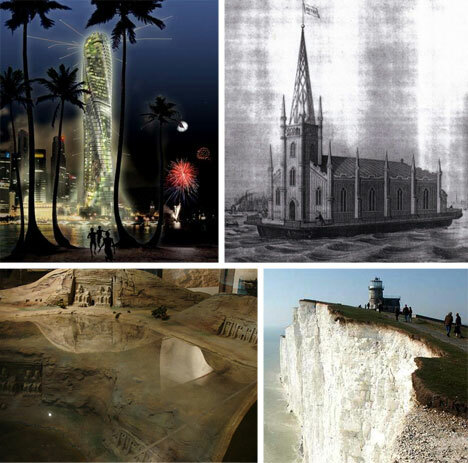 Here are twelve fantastic feats of ingenuity and structural engineering that range from pragmatic to artistic, from seemingly impossible moving buildings to incredibly creative building moving projects. 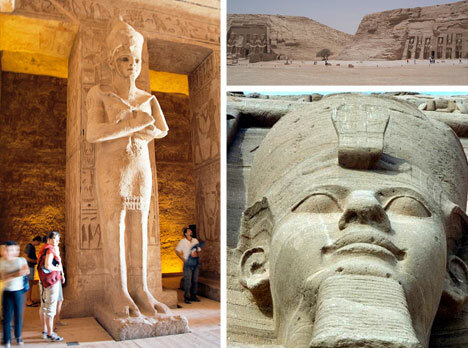 In one of the most amazing building moving feats in history the twin temples of Abu Simbel, carved out of an Egyptian mountainside, were moved to avoid flooding from the construction of a nearby dam along the Nile river. 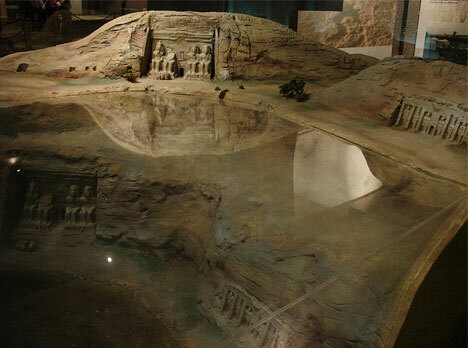 Shown above is a model showing the former and current locations, the former being hundreds of feet underwater and the latter placed in new artificial hillsides. The structures had to be carefully cut out piece by piece, labeled and individually reassembled at their new locations. The Peter Green House at Brown University appears at first glance to be a rickety candidate for a building moving project. The first video above video shows in fast-motion the process of slowly slide the building to its new location a few hundred feet away. Timing was critical for lifting this structure so no unequal stresses were introduced to the building which could have resulted in catastrophic structural failures. 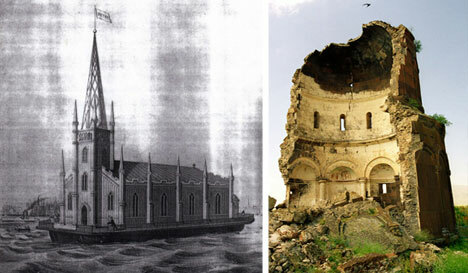 Built in the middle of the 1800s the Floating Church of the Redeemer was built in Bordertown, NJ and was towed to a busy dock in Philadelphia. The Churchman’s Missionary Association for Seamen was apparently interested in catering to sailors in a quite direct fashion. The building was eventually rolled onto land where it survived for a few years before succumbing to a Christmas morning fire. 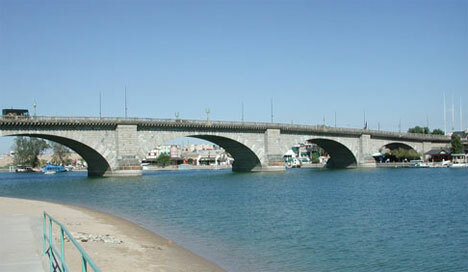 The London Bridge has an impressive history dating back two thousand years to roman times. It was destroyed and rebuilt dozens of times in wood and stone and it was one such stone bridge that was eventually disassembled and moved, piece by piece, all the way to the United States. The version in Arizona is not a complete replica but it is clad with the original stone and those stones fetched a handsome 2.5 million dollars. 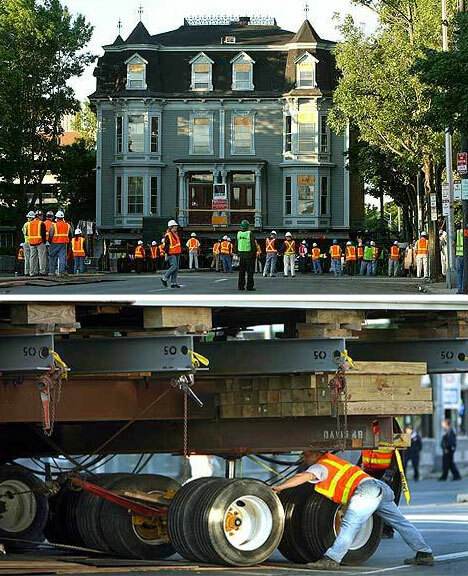 The four videos above show (respectively) the move of the Newton-Wellesly Hospital - a 900 ton brick building - the he simultaneous moves of three wooden structures at Harvard University, and the move of a residence along a canal and the transport of the Schubert Theater. The slower-moving videos have been sped up to show the progress of these incredible building moving projects. This man is truly a genius. A simple builder by trade he has turned his talents to recreating the entire structure of Stone Henge - all by himself. How is that possible? He has used a series of simple tricks and elementary home-made wooden machines that anyone could build to do two critical tasks: (1) move large objects (including entire buildings) leveraging with only his own muscle power and (2) tilt up objects using simple weights and pulley systems and, again, only his own strength. What does this prove? That if the original builders of Stone Henge used elementary technology an incredibly small crew could have built it. 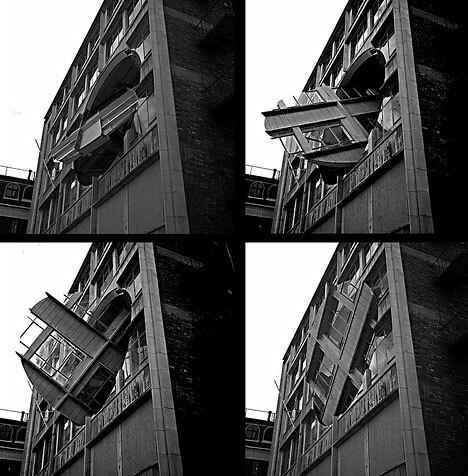 Turning the Place Over is a strange art project in which part of a building was essentially cut out and made to rotate through a series of positions including its original one - a literal deconstruction/reconstruction process to make postmodernists proud. The giant rotator used is a powerful device used in the nuclear industry and the resulting effect is a smooth (though entirely disturbing) view into the building that shifts slowly as the opening twists, morphs and eclipses again in a never-ending sequence. Perhaps the most talked about ‘moving building’ of all time is the first moving skyscraper set to be built in Dubai. 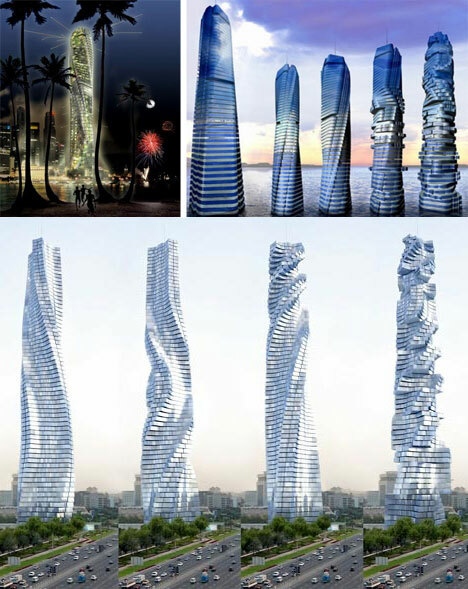 Eighty stories of towers are set to rotate around a central axis facilitated by wind-powered turbines on each floor. There is talk of building these in other major cities around the world but Dubai looks to be the first projected to have one finished - they are aiming for completion in 2010. Not quite sure you are ready to move an entire house? Check out these firemen as they relatively effortlessly lift a car into the air. This is probably about the largest scale at which such a feat would work but it is nonetheless a highly impressive way to defy gravity.